Miami's food scene is diverse, especially its Latin American options. There are countless Cuban restaurants as well as Peruvian, Argentinian, Mexican, Italian, vegetarian, and Caribbean cuisines to choose from in this beachy, sunny city, and that extends to breakfast. 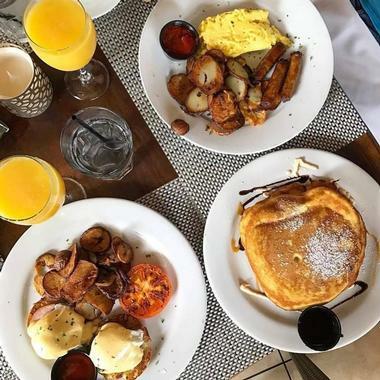 With bakeries, cafes, diners, sit-down brunch restaurants, and plenty more to choose from, visitors to Miami will find no shortage of amazing breakfast dishes and deliciously refreshing breakfast cocktails to try and enjoy. 11th Street Diner looks like a classic breakfast joint from the outside as it is housed in a shiny silver railroad-style car, all lit up with neon lights to proclaim to any who sees it that it has great food to serve to passersby. Inside, 11th Street Diner has just as much of a retro feel, with red upholstered bar stools along the long, tiled bar that divides the dining room from the open kitchen, where cooks flip pancakes and burgers and crack eggs onto the sizzling hot grill top. 11th Street Diner was first opened in 1948, and the landmark restaurant still maintains that classic diner atmosphere, from the art deco detailing right down to the classic and delicious food. 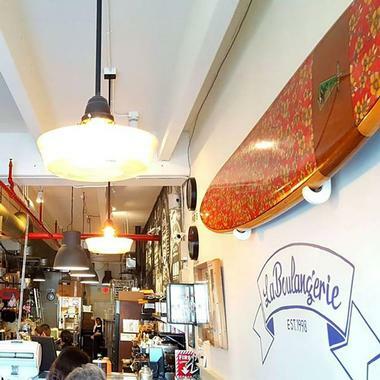 Serious coffee lovers will love ALL DAY, a Miami classic that Vogue called “the best cup of coffee in Miami,” and the New York Times put on its “must-visit list” for coffeeholics. The warehouse-like space is a passion project for its owners, and that passion comes through in the high quality of their products. Their coffee menu is extensive and made from fresh beans, blind tested each week from small batch roasters and chosen for the best taste. Their egg-centric breakfast menu includes items like breakfast sandwiches, eggs Benedict, and French toast, with a hefty selection of diverse and delicious baked goods from Zak the Baker. 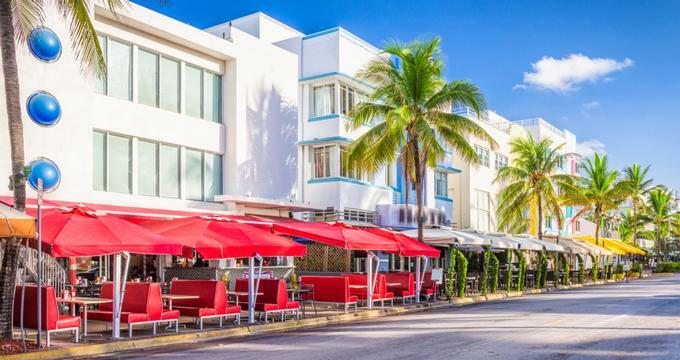 Balans Restaurant and Bar has a few locations in the Miami area, but the one in Miami Beach has umbrella-covered tables lining the sidewalk along Lincoln Road, lending an air of a casual French brasserie to the venue. 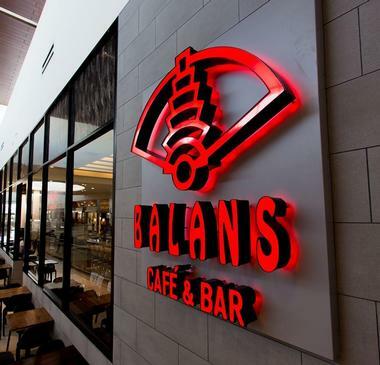 Balans opens each day at 8am and closes at 1am on Mondays through Thursdays and at 2am on Fridays and Saturdays. 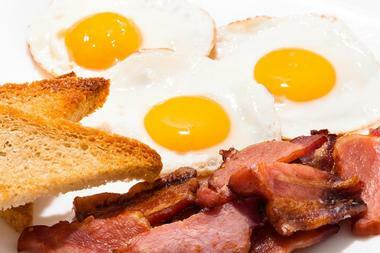 Breakfast is served every day from 8am to 11am, and brunch is served on weekends from 8am to 4pm. 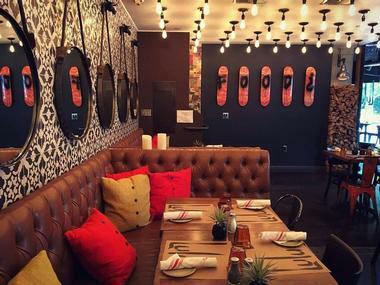 It’s a chill place with a fun menu full of globally inspired dishes like churrasco, California roll toast, breakfast burritos, and bananas Foster French toast as well as great breakfast cocktails like mimosas, Bloody Marys, Pimm’s cups, and St. Germaine elderflower blush. 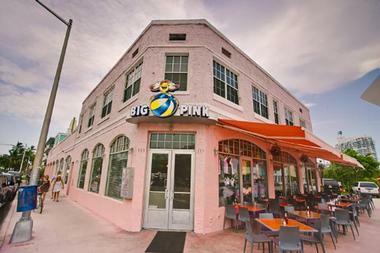 The Big Pink is a popular hangout spot in Miami Beach, known especially for its late-night hours and great comfort food. Open Monday through Wednesday from 8am to midnight, Thursday through Saturday from 8am to 5:30am, and on Sundays from 8am to 2am, Big Pink has a fun, retro feel with its shiny red tables, tall, industrial ceilings and fixtures, and delicious, classic foods. Breakfast, which is served anytime during Big Pink’s opening hours, consists of everything from a basic bagel and cream cheese to Pinky’s Hollywood Breakfast, which comes with two poached eggs, polenta fries, applewood smoked bacon, cheese sauce, fresh basil, and sautéed spinach. Black ceilings with bright red industrial fixtures, trendy white brick walls, and a paneled wooden counter set the scene at Crema Gourmet Espresso bar, where guests can try out some refreshing drinks, pastries, and food to start their day. With amazing breakfast dishes served daily until 2pm, like Greek omelets, croissant egg sandwiches, acai bowls, chocolate chip pancakes, and more, Crema covers all the best breakfast classics while also introducing new contenders to the list. Crema Gourmet Espresso Bar also serves fresh fruit smoothies and freshly pressed juices, hot and cold coffee drinks, and energizing power drinks. 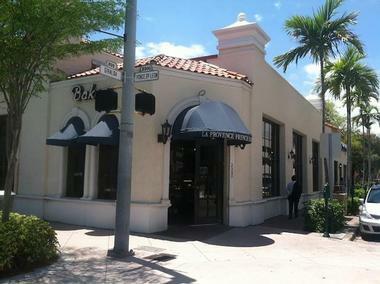 This classic, iconic Cuban cafe served the people of Miami for over 40 years before being forced to close its doors. 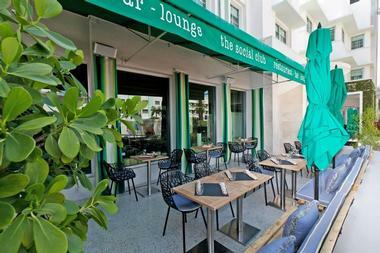 But now it has opened again in a new location on Alton Road to continue offering some of the best food in Miami. The menu is in Spanish and English and offers great classics from both American and Cuban cultures, from egg sandwiches to a Cuban breakfast platter of rice and eggs, sweet plantains, Cuban toast, and coffee. David’s Cafe Cafecito also served fresh juices like orange, mango, papaya, passionfruit, and soursop, and delicious coffee as well. David’s is open daily from 6am to 10pm. Deli Lane Cafe and Sunset Tavern is a casual sports bar with a dark wood bar, TVs for watching games, and plenty of local team decor adorning the walls. Deli Lane Cafe and Sunset Tavern also boast a lovely brick-paved patio area, with a shady awning, umbrellas over the tables, and even relaxing patio furniture. 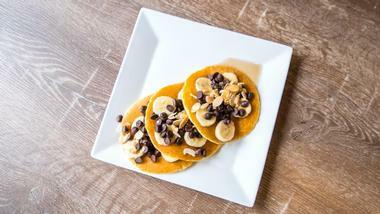 The breakfast menu offers healthy items like smoothies, a CrossFit Soul Omelet, gluten-free pancakes, and delicious energizing toast as well as less healthy, but equally delicious, options like creative omelets and eggs Benedicts, pancakes, waffles, and French toast topped with fruit and whipped cream, and classic eggs and cereal. 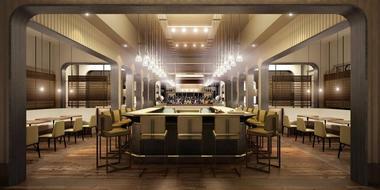 Edge Steak and Bar is a fabulous Miami steakhouse located in the Four Seasons Hotel Miami. Edge prides itself on their farm-to-table philosophy, serving farm fresh foods and ingredients to its customers every day in their dishes as part of their devotion to being a healthy and green dining option for their customers. Edge’s steaks and dinners are by far what the restaurant is most famous for, but they also serve a delicious breakfast menu on Monday through Saturday mornings from 7am until 11am. From their fresh fruit dishes and freshly baked pastries to their Cuban hash with maduros, pulled pork, and sofrito, Edge has lots of options for starting the day right. At Freshko Gourmet, customers can count on food that is fresh, delicious, and unique. The focus of Freshko Gourmet is on crepes, sandwiches, and salads, but they also serve an amazing breakfast as well, with options like a Scandinavian eggs Benedict, Mediterranean omelet, and even a breakfast sandwich of eggs, meat, and cheese sandwiched between two halves of a Belgian waffle. Freshko also has an extensive espresso bar, with a wide selection of coffee drinks, both hot and iced, for guests to enjoy. Other drinks include delicious fruit juices from orange to watermelon. 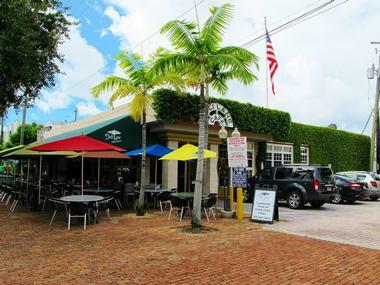 The outdoor lounge at Greenstreet Cafe wraps around the exterior of the restaurant and overlooks the street in Coconut Grove, so customers can watch passersby and enjoy the beautiful Miami weather while partaking in a delicious meal. The place feels like a classy but casual bistro, with corrugated metal ceilings that form a stark contrast to the elaborately upholstered loveseats on the large patio. 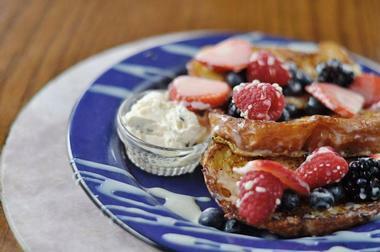 Before ordering a coconut crusted French toast, pumpkin pancakes, a goat cheese and tomato omelet, or a homemade cinnamon bun, guests can indulge in a sinfully delicious mimosa, Bloody Mary, or a breakfast cocktail, like the Grove Goddess, made with St. Germaine, Aperol, fresh watermelon juice, and cava. La Boulangerie Boul’Mich is a French-style bakery, cafe, and breakfast eatery that offers fresh-made foods and baked goods every day. Their breakfast menu is quite egg-centric, with options for omelets, Benedicts, scrambles, and more as well as some classic French fare and other breakfast dishes like a croque madame, pain perdu, and buttermilk pancakes. Beverages are nonalcoholic, with options of freshly squeezed juice, Orangina, iced tea, and sparkling mineral water. Then, of course, there’s the pastries. Customers would be remiss if they did not try one of the incredibly flaky croissants, available in a variety of flavors, or take home a baguette or brioche bread on their way out. The dessert case at La Provence in South Beach really shows off the colorful macarons, long and mouthwatering eclairs, artfully arranged fruit tarts, and decadent personal cakes that the bakery and cafe is known for. Breakfast fare at La Provence ranges from a traditional French breakfast of coffee or tea and a toasted baguette sandwich with butter or jam to omelets, Benedicts, and French toast. Breakfast sandwiches are served on homemade baguettes and bread, and while in La Provence, it’s practically mandatory to try out one of the buttery, flaky croissants made in-house. Las Olas Cafe in South beach is open seven days a week from 6am until 8pm, serving up amazing Cuban food and classic breakfast items all day long in a casual, no-frills setting. 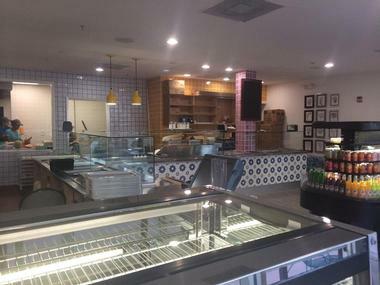 The dining area in Las Olas Cafe is very limited, but food comes packaged to go, so customers can take it with them if the small dining room is full, which it generally is due to the cafe’s popularity and overall quality. Everything from the coffee to the breakfast sandwiches to the pastries are fast, affordable, and downright delicious. The patio at Lulu in the Grove is paved with brick and set with artsy industrial metal stools beneath wooden tables and tall umbrellas for shade. Inside, the restaurant is just as striking, with mismatched chairs, leather booths, and masterfully selected artwork on the walls. 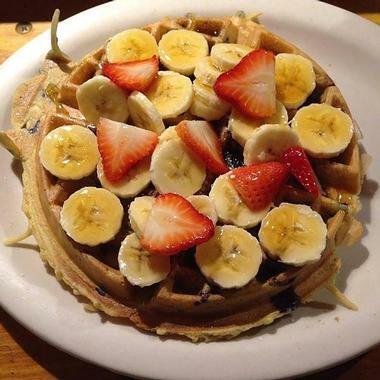 Lulu in the Grove serves a wide selection of Belgian waffles, including a red velvet waffle with cream cheese icing, a bacon waffle infused with homemade bacon jam, and chicken and waffles, which comes with battered and fried chicken as well as watermelon and bourbon syrup. 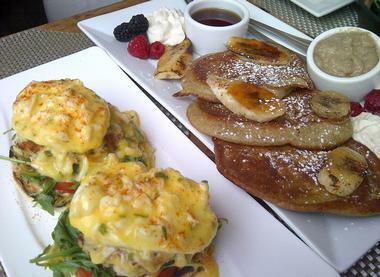 Lulu in the Grove also offers omelets, breakfast platters, and eggs Benedict. The setting for Morgans Restaurant, an old house with a covered porch where guests can sit and chat as they enjoy their food and coffee, lends a decidedly homey feel to this restaurant, which also serves homestyle comfort classics to add to the overall ambience. At Morgans, breakfast and brunch options include homemade sticky buns, brioche French toast, house-cured salmon plates, omelets, chocolate-dipped waffles, English breakfast, and French toast stuffed with mascarpone and raspberries. They also serve delicious coffee, fruit and vegetable juices, fresh smoothies, and pitchers of Bellini, sangria, mimosa, or Kir Royale. 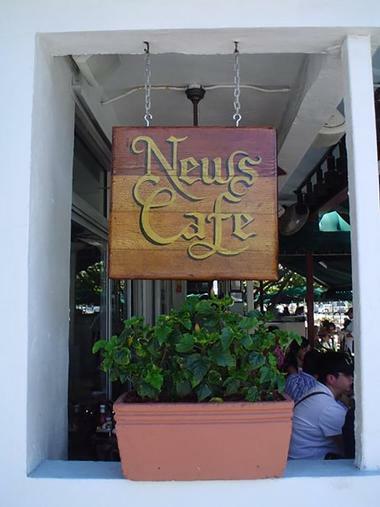 The location of News Cafe in Miami Beach is absolutely unbeatable, sited on the corner of 8th Ave and Ocean Drive, just steps away from the swaying palms and sandy stretch of the beach. This iconic cafe has plenty of outdoor seating so guests can enjoy people watching and feel the warm Florida sunshine, but also has some indoor seating options as well for those who wish to take advantage of the air conditioning. News Cafe is open 24 hours a day, 7 days a week, and serves up great breakfast dishes such as eggs Benedict, omelets, classic American breakfast platters of eggs, toast, bacon or sausage, News Fries, juice, and coffee, and delicious French toast, pancakes, or waffles hot off the griddle. 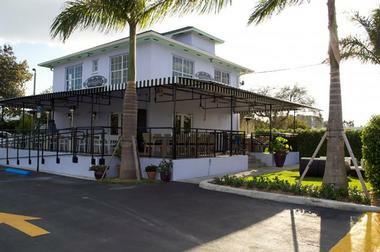 This cozy restaurant and bistro in Miami Beach features an airy, wood-accented dining room with large sliding glass doors and windows to let in some of the beautiful natural sunlight, as well as a colorful, large outdoor patio covered by massive gazebo-style umbrellas to provide a little bit of shade on hot Miami days. Oliver’s Bistro has been serving the people of Miami Beach since 2002 and is owned by a French immigrant from Lyon, who melds French and American fare together in his menu. Breakfast is served Monday to Friday from 9am until 11am, and on weekends, Oliver’s Bistro offers its award-winning brunch menu from 9am to 3pm, featuring popovers stuffed with eggs, sausage, and cheese, Dutch apple pancakes, NY sirloin steak and eggs, and a croque madame brioche. The Daily Creative Food Company has two locations in Miami – one in Edgewater on Biscayne Blvd and another in South Beach on West Avenue. 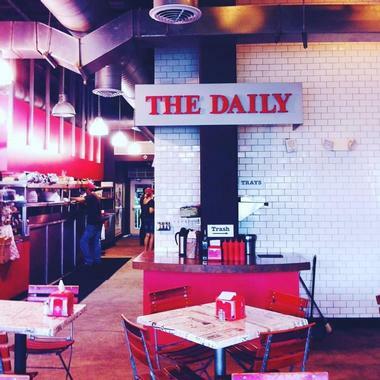 This delicious eatery is newspaper themed, with fun decor and hundreds of fantastic menu items to choose from. When it comes to breakfast, The Daily Creative Food Company serves up items like the Miami Vice, which consists of two eggs over a Cuban hash, the Me So Hungry, which is eggs over traditional fried rice, or The Hangover, which comes with a short stack of thick buttermilk pancakes, two strips of bacon, scrambled eggs, two sausage patties, and home fries. The Front Porch Cafe has it all when it comes to seating arrangements: A large bar, a dining room that can also be used as a big banquet room and, as the name implies, a huge covered front porch terrace for outdoor seating. 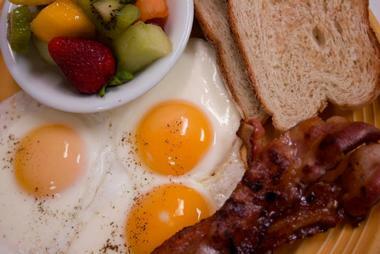 Open every day from 7am until 11pm, Front Porch Cafe offers breakfast all day. 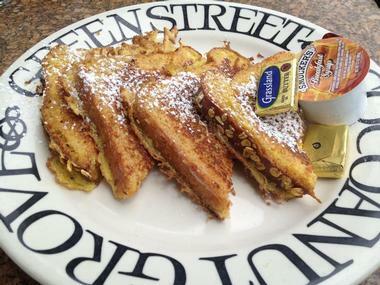 Some of their most popular menu items are the challah French toast, which have a lovely fresh taste due to the fresh orange zest they are cooked with, the Front Porch Eggs Benedict, served with fruit, home fries, tomatoes, or a salad, and the Sicilian omelet, stuffed with sausage, peppers, onion, marinara sauce, and mozzarella cheese. The Local House serves up a seafood-centric menu in this lovely restaurant located in the Sense Beach House Hotel. The decor is decidedly ocean chic, with model ships on display, rustic wood- paneled bars, and seating, tables, and light fixtures that would look more at home on a yacht than on land. Guests can peruse the breakfast menu while enjoying a Bloody Mary, Kir Royale, glass or a pitcher of mimosa or Bellini, or one of The Local House’s other great breakfast cocktails. Breakfast items include a shrimp and crab-packed seafood scramble, quinoa avocado toast, smoked beef skillet, or a buttery lobster eggs Benedict. The Social Club, located in Miami Beach, has an amazing brunch menu that is beloved among Miami locals and visitors alike. The emerald green accents and unique lighting fixtures set the scene at this classic restaurant, which serves lots of local and regional food. The Social Club’s fantastic homemade ricotta doughnuts are a great way to get the meal started, before moving on to an entree like the lobster quiche, Sun Fresh Farm omelet, chicken and waffle, or orange Creamsicle French toast. Guests can also indulge in bottomless mimosas, served with a flight of juice options, or another boozy breakfast cocktail, like the Morning Mule, Red Bottom, or Old Fashioned Morning. Wagon’s West Restaurant is located in the Suniland Shopping Center and opens every day at 6:30am. It closes at 4pm on Sundays, closes at 9pm every other day of the week, and serves breakfast all day. This low-key, family-friendly spot has pancakes, French toast, omelets, and waffles as well as a list of daily, weekly, and monthly specials that is always changing with something new and exciting to offer. Wagon’s West Restaurant offers big portions, affordable prices, and delicious food for everyone who sets foot in its doors.